The doors open to a pier-themed pre-show area filled with hands-on activities and tanks full of remarkable sea life. Guests will be transported back in time through L’Oceanauts Submarine Explorations’ vintage “mission briefing” film that explores the beauty of coral reefs. The audience will encounter real sea stars, jellyfish, sea sponges and squids while also learning about the importance of sea-life conservation. Then, step aboard “Le Plunger” submarine and take your 3D glasses before you depart from the dock for open water. 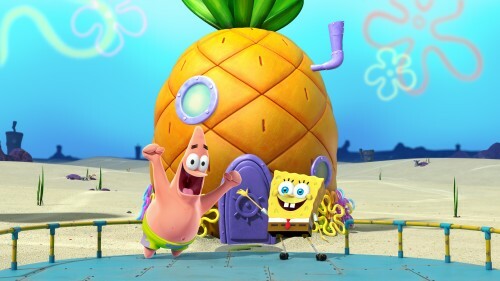 The SUB then descends to a familiar underwater town as SpongeBob SquarePants and your tour guide, Patrick Star, appear through the front window of the SUB. Have improvised, real-time interaction with Patrick while he takes you to destinations of your choosing through Bikini Bottom. They can have their fortune read by Patrick in Goo Lagoon, try the jellyfish dating call in Jellyfish Fields or learn a special dance from Sandy Cheeks. Guests will also try to stop Plankton from taking over the SUB in his evil plan to steal the Krabby Patty secret formula. Smell the sunscreen, pop bubbles above your head and hit around a beach ball when the 3D images on the screen transform from digital to real time through exciting 4D sensory elements and live narration. The SpongeBob SubPants Adventure is a non-stop whirlwind of surprises that is fun for the whole family only at Moody Gardens! trademarks of Viacom International Inc. Created by Stephen Hillenburg. half hour this side of The Simpsons . More importantly, it’s a prgoram that almost all family members can watch without becoming offended (well, except for those folks wondering about SpongeBob’s sexuality). It’s a fun way to spend an hour and a half with the kids. After losing a treasured promotion to manage the Krusty Krab 2 restaurant because he’s just a kid, SpongeBob is the only person who can stop Plankton from taking over Bikini Bottom. Plankton resorts to Plan Z (having used every other plan in the alphabet) to frame Mr. Krabs for the theft of King Neptune’s crown. The diminutive Plankton hopes to discover the secret to the Krabby Patty and ultimately rule the undersea world! Meanwhile, Spongebob and his dim witted friend Patrick must travel to the dreaded Shell City to recover the King’s crown and stop Plankton before it’s too late. Featuring a marvelous cast of guest voices including Jeffrey Tambor ( Arrested Development ), Scarlet Johansson ( Lost in Translation ), Clancy Brown ( The Shawshank Redemption ), Alec Baldwin and, of all people, David Hasselhoff, the film may lack the sparkle of the best episodes of the series but it more than makes up for this shortcoming with a number of witty gags. Kids will enjoy the antics of SpongeBob and Patrick while adult males will empathize King Neptune’s attempts to hide his bald spot with his crown (he’s desperate enough to resort to Hair in a Can at one point although that doesn’t quite work out as planned) and envy David Hasselhoff as he uses his pecs to launch the duo back into the sea. There’s also a serious message as Mindy the King’s daughter encourages SpongeBob and Patrick to be kids and be OK with it. Featuring a great transfer with bright and vivid colors, Bikini Bottom has never looked so, well, animated. A very sharp transfer with few digital artifacts to distract viewers from the absurd images, Spongebob looks better than any sponge has a right to. The 5.1 Dolby Digital Surround mix is used to good and sometimes very comic effect. The 20 minute animatic segment gives viewers a peak into all the preparation work that went into producing the movie. Director Hillenburg’s comments provide interesting and sometimes funny insights into the challenge of producing a movie much less a TV series as funny as this. The behind-the-scenes featurette is both charming and quite funny with a glimpse into everything from creating the absurd story at the heart of this film to the hilarious recording sessions featuring the voice cast. There’s also a featurette The THQ game demo is actually quite fun but doesn’t really provide that much of a taste as to what the game could do. The Case of Sponge Bob features Jean-Michel Cousteau in a tongue-in-cheek short documentary. We see an informative and fun discussion of real sponges with undersea footage narrated by Cousteau with writer/director Hillenburg. Saving the Surf features Chad Nelsen, Matt McClain and Steve Pezman founders of the Surfrider Foundation discussing the importance of keeping our environment clean and the impact of our pollution on the ocean and our beaches. The teaser trailer for Submarine features footage of Das Boot , U571 and The Hunt for Red October intercut with footage created for the cartoon trailer for The SpongeBob SquarePants Movie . There’s also previews for other Paramount family friendly titles as well. A funny visit with the denizens of the deep, The SpongeBob SquarePants Movie will keep you and the kids entertained. The film doesn’t pander to kids and has just the right level of slapstick humor to keep adults entertained as well. Although it does have a serious message at its core, the film is a lot of fun.